Kamera Betrug: steven.alan@hotmail.com bietet High-End Plattenspieler zum Low-Price an. 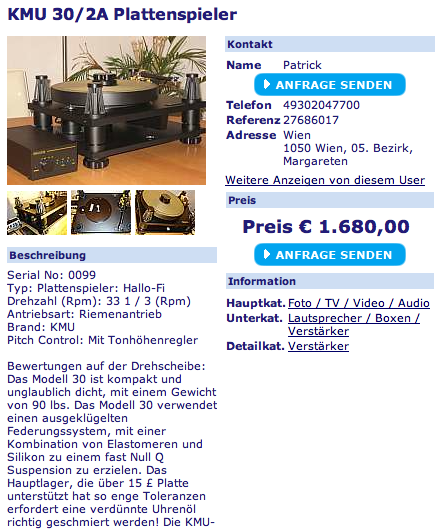 steven.alan@hotmail.com bietet High-End Plattenspieler zum Low-Price an. Dieses Angebot ist schon sehr speziell. Hier wird ein High-End-Gerät angeboten - ein Plattenspieler der Marke KMU, ein KMU 30/2a. Der Angebotspreis von 1.680 EUR klingt für Laien hoch. Insider wissen jedoch, dass es sich hierbei um 1/10 des Marktpreises handelt! Das ist schon unglaublich. Warum sollte man so ein Gerät zu einen solchen Preis weggeben. Für HiFi-Fanatiker ist audigon.com aus den USA eine der wichtigsten HiFi-Börsen. Auf audigon werden die baugleichen SME 30/2 und SME 30/2A für 16.500 / 17.000 $ angeboten! Daher raten wir ganz deutlich ab, sich auf solche Angebote zu melden - vor allem wenn man die üblichen Marktpreise kennt. Ein großes Dankeschön geht an Helmut aus Österreich, der uns dieses Angebot sowie die Insiderinformationen mitgeteilt hat! I hope you understand English because I don't write your language so well even if I lived and worked there for 9 months. I want to let you know the item is in perfect condition. The price from the add is my final price including all taxes. If you are interested to buy it, please contact me back, and I will tell you more about how we can complete this deal. 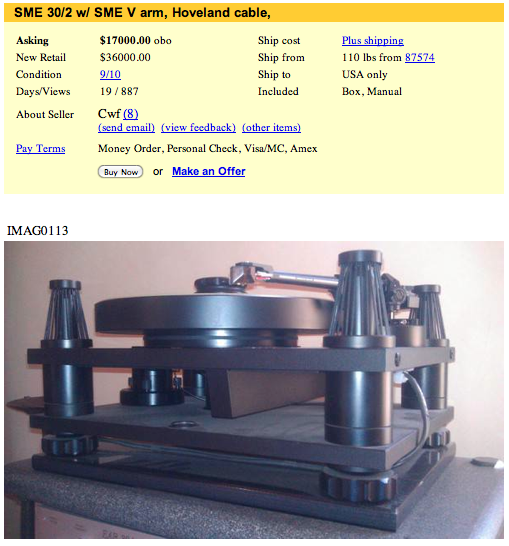 I have this turnable for about 2 months and is in very good condition . This is the photos with this turnable . The final price is 1680 euro including all the shipping taxes . I sell at this price because my wife is in hospital and I need to pay the taxes for this if you understand me . I had a work contract in your country and I bought the item from there. I have moved back to Greece and I don't need it. First I will send the item to the shipping company and you will receive the tracking number# from them, so you can verify. After that, you will send the money (Bank Transfer) to the shipping company agent and they will keep the money until you will receive and inspect the package. When you will receive the item and all is ok, I receive the money from them. The transaction is very easy and secure for both of us ! I will wait your e-mail as soon is possible.